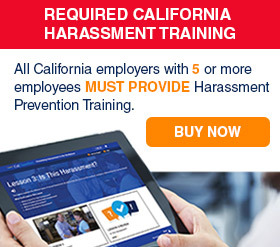 Compliance Alert: Effective January 1, 2019, new postings are required for California Wage Orders 1 through 16 due to increases in minimum wage and lodging rates. Since minimum wage and meal and lodging rates are not included in Wage Order 17, this wage order will not be updated for January 1, 2019. CalChamber’s laminated 27.5” x 21” English poster and 27.5” x 20” Spanish poster each combines the multiple pages of Wage Order 17 into one convenient poster. These posters are recyclable. Wage Order 17 regulates wages, hours and working conditions for Miscellaneous Employees. 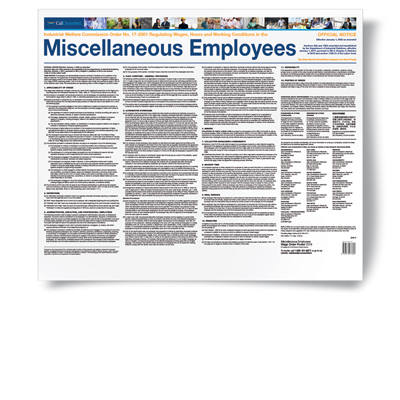 “Miscellaneous employees” means any industry or occupation not previously covered by, and all employees not specifically exempted in, the IWC’s Wage Orders in effect in 1997 or otherwise exempted by law.